I’ve concluded there must be 2,345 reasons (at least) for someone to write. I bet if we consider humanity from the dawn of civilization to today, we’ve discovered all the reasons why someone feels compelled to write. And unearthed a thousand new reasons in the process. I imagine it will go on like that for eternity–every reason we list, we unearth a new reason. Until Jesus comes back, we blow ourselves up over something stupid like someone who wore the wrong hat on a state visit, or we mutate into tiny rodents which have an insatiable hunger for pencils and electronic devices. In the spirit of preserving my own thoughts before the mutated rodents devour everything, I’ve decided to list my reasons. 1) I write because writing is my oldest friend. I don’t have many memories of my childhood. My father was an alcoholic. I remember hiding from him inside a little hole in the wall behind our kitchen. That’s the first time I’ve written that where someone could see it. I remember bits and pieces of my family. The fire. The sound my father’s feet made when he walked across the floor after his stroke. Step. Slide. Step. Slide. Foster homes. I also remember reading. And the teachers rushing up to me in the hallways after class and pressing books into my hands. Why did they do that? Did they rush up to all children and do the same, or just the ones with holes in their shoes? I remember finally putting words on paper and writing my first story. It won a national competition. Since that time, writing has been the friend that has stayed with me when everything else changed–jobs, people, cities. Even when years went by and I didn’t write a thing, this longing stayed inside of me, kept me company, waited for me. 2) I write because I have something to say. It’s an odd thing what happens when you think you have something to say. It changes all the time. I don’t know if you’ve noticed that, but I have. My political views have changed. My ideas about culture. My thoughts on family life. No matter where I am on my spectrum of beliefs, I can explore my thoughts and ideas by writing about them. The best part is when I go back and read what I’ve written years ago. Sometimes I laugh at myself. Other times I give myself a pat on the back. I’m filled with a lot of hot air which means I need a release. I have opinions about racism. The media. Critical thinking. Relationships. Humanity. Life. Love. Pain. Humor. Kindness. Wisdom. Respect. Authority. Children. God, I have so much to say and not enough time to say it all. 3) I write because this is my way of recording the world. This goes hand in hand with the previous reason, but where the previous reason has more to do with philosophizing, spouting my own ideas about how and why people act the way they do, this reason has more to do with interpreting the world and recording it as I see it. A poem might explore how I feel about my mother. A fire in a book might mirror my own experiences with the fire. Characters who react to recent events allow me to describe what’s going on now, in 2015, and the impact it has on people. 4) I write to remember what happened. Writing to remember what happened in the past and the events that have shaped me is painful and healing, so I suppose this one could fall under therapuetic or sadistic reasons. 5) I write to consider the future. One of my favorite reasons. I love wondering what will be. I want to open the box that contains all the secrets from the next hundred years. This is my chance to explore everything from science and technology to the light and dark sides of humanity. 6) I write to make known things that happened in the dark. I think someone else said that and I don’t want to get in trouble for stealing a quote, but I tried to re-write the reason three times without success. Writing gives us the power to expose the truth about anything. Individual pasts, social injustices, atrocities against humanity, or the time someone stole your smelly socks–writing is our chance to shout to the rest of the world about these things. 7) I write to take the hidden thoughts and dreams in my head and introduce them to the light of day. Each time I write, whether it’s poetry, a short story, or a novel, a piece of me is inside every word. Whatever my thoughts and dreams are, they show up on the page. I give them a voice. Each day the voice might change, but it’s always my voice. 8) I write to tell stories. When people tell me a story, it comes to life in my head. I see the man falling off the cliff. I imagine the rush of wind against his face. I imagine his legs spinning madly in the air. I want to do the same for others. To tell the story in such a way that the reader can imagine it happening around them and to them. 9) I write to make people laugh. Laughter makes you live longer. 10) I write to make people cry. Not that I enjoy seeing people weep. I want people to feel something, though. I want to connect with readers in a way that goes beyond words on a page and images in the mind. What I’m trying to reach is the reader’s heart. 11) I write to make people think. We’re emotional creatures. Yet we’re most alive when intellect and emotion come together. Emotion is easy to pull off. The media has excelled at it for as long as towns have used criers. Find a story that creates a reaction, go with that. Ask questions that fuel that emotion. I want to write stories that touch people, but also encourage people to think. To think outside the box and to consider the complexity of situations. Look at things from new angles. 12) I write to live other lives. I didn’t like my childhood much. Any part of it. But when I read stories, or wrote them, I got to be other people. My adulthood has turned out better, but I still enjoy living other lives via my writing. It’s a way for me be an archaeologist, a professor, an egyptian princess, a space trooper, a machine, a priest, and a mad turtle who talks. Nothing tops that. 13) I write to leave a mark. I’ve been thinking about this one a lot lately, especially following some medical issues I had last year. I want to leave something for my children. A legacy. Whatever days I’ve been given on earth, I want to use them wisely. Remember that book, Eat, Love, Pray? Mine would be Pray. Love. Play. Laugh. Write. 14) I write so the characters in my head will finally shut up. Ever since I could remember, I’ve been fascinated by people. Does that woman with the long braid walking in front of me to the subway station have a dog? Does the man with the sour expression reading the Metro always wear a yellow hat? Or only on Saturdays? These were the questions I’d ask every time I went out. Then I started making up lives for them. Bob worked at the bank. He was 32, lived with his grandmother and had a secret obsession with Batman. He also believed a spy worked at the local chinese take-out place and kept leaving him messages in the fortune cookies. Pretty soon, Bob was a fully realized character in my head and I had to do something with him. Because if you do that every time you walk outside the door, it gets crowded up there. And each character pushes and shoves her way to the front, begging to speak. The only way to shut them up is to tell their story. 15) I write because the feelings I carry inside are too intense and if I don’t find a way to release them, my heart will explode. I’m a sensitive person. I cry at sad movies. I cry when I read sad books. I cry when I think of all the people affected by the war in Syria. Heck, I cry when I read the news, which is why I don’t do that anymore. I’m a defense attorney’s dream for a jury candidate. When I hear about someone hurting a child, or read the latest CNN story, I choke up. Then I start thinking about all the children who at that moment are fighting for their lives. All the children who are hiding, or begging someone to stop hurting them. It’s not just the stories about children, either. I cried when I read about the christians who were thrown overboard a refugee boat. And the one about the man whose dog stayed at his master’s grave and refused to leave. Or the one I read this morning about the police officer who sang Twinkle Twinkle Little Star to a toddler at a fatal car accident. I sat here and wept. Because I’m weird, I know. I can’t change who I am or pretend this doesn’t happen. And it’s not just sad feelings either, nor is it anything like Manic-Depressive. I’m just a passionate person. Joy, stress, disappointment, excitement, they’re all on steroids inside of me. I feel everything, about a million times stronger than I was probably supposed to feel it. I HAVE to write to release these emotions. 16) I write because I love exploring the impossible. Reality is great, until you get stuck in it. People scoff at speculative fiction, but I gotta say there’s nothing sadder than hearing the words, ‘It’s impossible.’ Or, ‘It can’t be done.’ Or, ‘We can’t do that.’ I’m teaching my children these are horrible phrases. We say them because we’ve forgotten how to imagine the impossible. My daughter’s teacher told me so few children bother to play make-believe anymore. If we don’t feed our imagination, our reality will starve. Many of our modern inventions came from speculative fiction written years ago. I want to keep up that trend. 17) I write to prove ‘them’ wrong. They say only a few make it. They say not to give up my day job. They say I won’t break into the industry unless I know someone I’ve met by attending a hundred writer’s conferences, conveniently located at least thousands of miles from my home. They say only extroverted salespeople can become writers –it’s just the way it is now. They say women who want to write shouldn’t have children, or if they do, they should only have one. They say I can’t be a mom and a writer. I’m going to prove all of them wrong. 18) I write because I’m good at it. I’m not Margaret Atwood. Or Jim Butcher. Yet. I’m me and I still have a lot to learn. The day I claim I know all the secrets of the craft is the day someone needs to kill me. But! We all have our strengths. Some of us are fantastic chopstick makers. Or social networkers. Or great with numbers. I’m good with words. I enjoy telling stories. My natural strengths and interest focus around writing. I’d be a fool to waste that. 19) I write because I hate meeting new people. I’m an introvert. I avoid large social gatherings. I enjoy spending time alone. At home in my pj’s. Which is interesting because I LOVE other people. I’m generally interested in their life, their history, their dreams and them as a person. Yet it never fails, when I do meet people, I’m socially awkward. It’s best you know this now about me. I say the wrong thing. All the time. I worry if I’ve asked enough questions about their lives. I worried if I’ve made enough eye contact. I worry if I’ve jumped to another conversation topic without providing an adequate amount of sympathy / empathy / interest in the one I just skipped over. Peek inside my brain during a social gathering and you’ll see this giant ball of stress hormones having a party. Writing allows me to communicate while the stress hormones get a chance to sleep. 20) I write because I love meeting new people. I love meeting the characters in my stories. They’re so different and volatile and sweet and fanatical and sometimes a little mad. I love them! 21) I write because I love learning new things. Research has become one of the funnest elements of writing for me. If I could go to school forever, I would, because I was cursed with a desire to learn everything (except tax codes). For Ashborne I spent weeks researching old viking boats and boat building. That knowledge shows up in maybe ten lines in the book, but I had so much fun researching it =). For Jakob’s Journal, I spent a lot of time investigating the wine monks made at monasteries. A friend of mine spent a weekend at a cloister under a vow of silence so she could write accurately about that experience in her historical novel. I want to do that! I can learn how to make sushi rolls and work in an emergency animal hospital. Go rock climbing. Research dragon lore. Learn how to make my own dyes from plants. Read up on how to build a cloud city. The possibilities are endless! 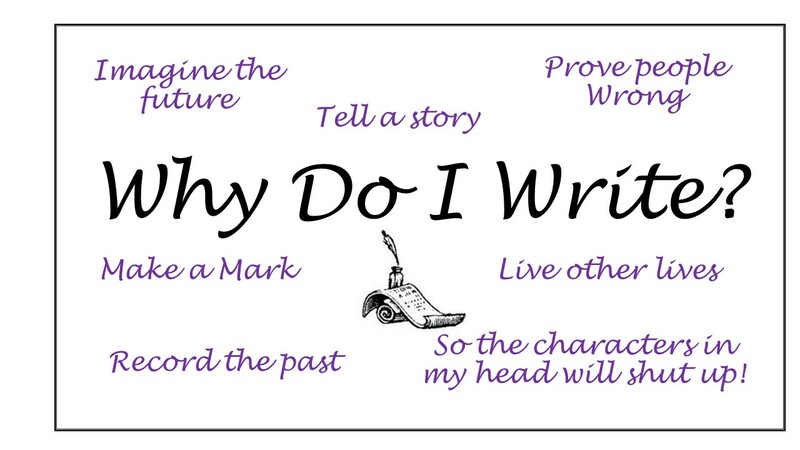 22) I write because I would wither away inside if I didn’t.